Picture Search Results. page 10 of 146. (from page 2 of the 1966 Collection) Raven Black 1966 Mustang hardtop owned by Steven Behar from Diamond Bar, California. This is was featured Attitude Of The Week photo for the week starting November 30, 2008. Steve just completed the restoration. He repainted it with the original color. It has it's original 6-cylinder engine under the hood. Steve adds, "I bought the car in July, 2008. It has 38,000 original miles. It has no power options. It is a nice California car that is in excellent stock condition." (from page 2 of the 1966 Collection) Red 1966 Mustang GT hardtop owned by Juan Lemus from La Puente, California. This was our featured Attitude Of The Week photo for the week starting 12-14-08. This GT has a hood scoop and a red/white two-tone Pony interior. (from page 3 of the 1966 Collection) Sauterne Gold 1966 Mustang hardtop with a black vinyl top option (originally $74.36) and the base 120hp (at 4400rpm), 200ci, 1 barrel, 6 cylinder engine. (from page 3 of the 1966 Collection) 1966 Emberglo orange Mustang hardtop with full wheel covers and metal rocker panel molding. (from page 3 of the 1966 Collection) Take a look at this fully custom 1966 Mustang hardtop! It has everything. Some of the modifications include: custom fully molded E2 body kit, custom platinum silver paint, Boyd Coddington 17x18 inch wheels, Shelby hood scoop, and Hankook 215/24/17 X 245/45/17 tires. (from page 3 of the 1966 Collection) Manville Smith just purchased this Wimbledon White 1966 Mustang convertible (April 20th, 2009) with only 40K on the odometer. This is our featured Attitude Of The Week for the week starting 5-24-09. Manville tells us more, "It is very original and highly optioned. The paint is original and the body/frame is straight and rust-free. The car was originally a Ford company car ('Transportation Services' DSO) and it still has the Ford Employee parking decal on the rear window. Original items include the C-code 289 V8, C4 automatic transmission, power steering, front disc brakes (rare on a non-GT), 2-speed wipers, luggage rack, 'Visibility Group' (remote controlled door mirror, day/night mirror), power convertible top, styled steel wheels, Ivy Gold and White Pony interior (all original) with console, AM Radio (works perfectly), wheel arch moldings, and rocker panel moldings. Non-original items are the air conditioning and the dual exhaust." 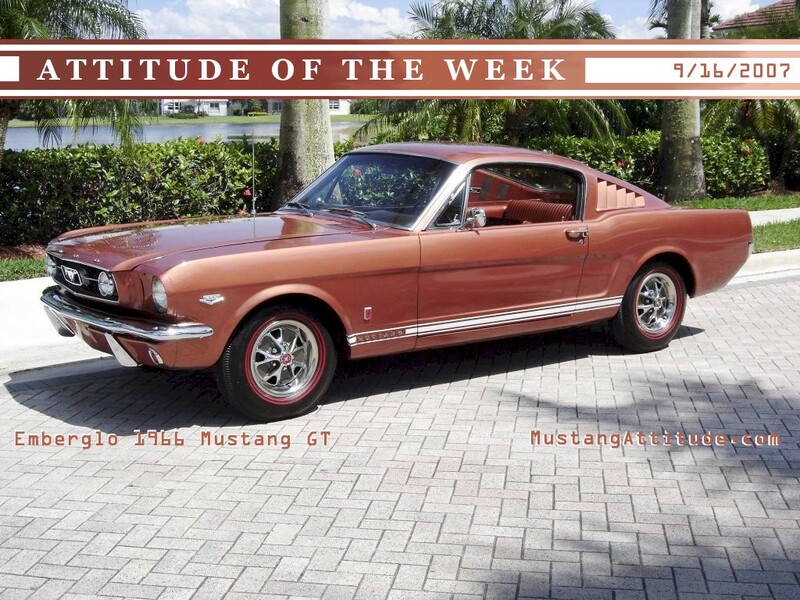 (from page 4 of the 1966 Collection) Here is a beautifully restored Sauterne Gold 1966 Mustang hardtop owned by Gary and Tina Fishbaugh of Allegany, New York, and was our Attitude Of The Week for June 7th, 2009. They say they bought the car in the spring of 2008, it has been repainted but most of the interior and chrome is original, and all the numbers match. (from page 5 of the 1966 Collection) Check out this 1966 Mustang magazine ad. It features a Candy Apple Red 1966 Mustang hardtop passing a green traffic light. It starts off with, "Okay, you can stop asking, 'Why doesn't Mustang bolt Cruise-O-Matic behind the 271 solid-lifter V8?" It talks about the new option of an automatic with the High Performance 271ci V8 engine. (from page 6 of the 1966 Collection) This Black 1966 Sprint 200 hardtop is owned by Aldo Rivas of Clovis, New Mexico and is our Attitude Of The Week for September 6th, 2009. Aldo writes, I own an all original 1966 Mustang Sprint 200 which I located on Craigslist in September 2006. The Mustang was originally purchased from Muriel Carlson of Seattle WA on March 3, 1966 from Westside Ford, Inc. Seattle WA. The Mustang was posted as a 1966 Mustang Coupe, I started to get more interested when I found out it had 87,000 documented miles, and being an all original Sprint 200. After talking with the owner I found out the Mustang was his fathers who he purchased from the original owner in 1972. I drove to Lake Stevens to have a look at the Mustang and was surprised to see it in such good condition for being original. Today I have 92,000 miles on it, I only take it out on nice days. Some cool things are I have the original owners manual, all receipts from 1972 to present and top ot off the radio works. The only work I have done is a major brake job and minor carburetor rebuild. The Mustang still has the original spare tire that I took to Les Schwab to get inspected and re-inflated. The tires and wheels were purchased from Les Schwab in 1993 when the Mustang had 80,695 miles, so that calculates to the car being driven about 706 miles a year since 1993. I plan on keeping the Mustang original, sure she has some bumps and scratches but that adds to its character. Now if I only bought the 1967 Shelby GT-350 I test drove in El Paso TX in 1986 for the asking price of $7000 OBO, my life would be complete.